If you have kids and are like me, your garage is probably overrun with bikes and scooters. I’m glad my kids have these fun toys to play with (and help keep them healthy by going outside and exercising), but wow, having bikes and scooters all over the garage drives me bonkers! The scooters refuse to stay upright and always topple over. The bikes are always blocking my car from being parked in the garage. There really just isn’t a good out-of-the-way spot to put all this stuff! 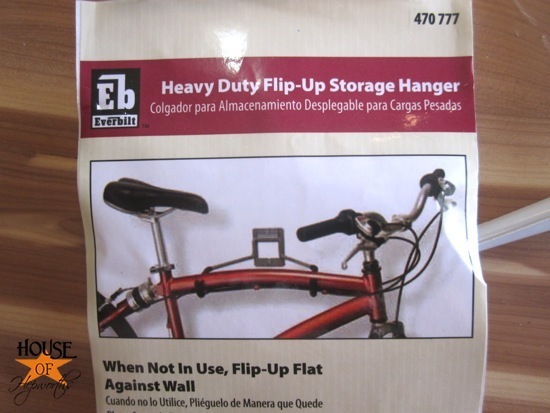 Well, when I was at our local hardware store a few weeks ago, I stumbled on these cool bike hangers for only $5 each! 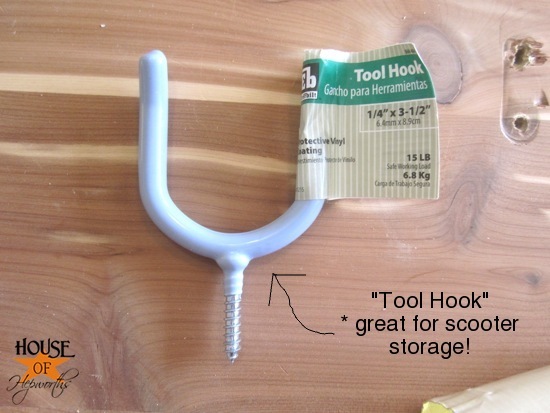 That got my wheels turning and before I knew it I had two bike hangers in my basket as well as three of these tool hooks. The bikes are heavy, so I needed to install the bike hangers into either the studs or some other type of really secure wood. The studs weren’t positioned exactly where I wanted the hangers, so I took some MDF strips leftover from My daughter’s Board & Batten and nailed them to the wall. Then I used some heavy duty screws and screwed the MDF planks securely into the studs. Now I can put my hangers wherever I want on the MDF WOOD and they will indirectly be supported by the studs in the wall. I had to use two pieces one above the other because my pre-cut 3″ strips weren’t wide enough for the bike hangers. 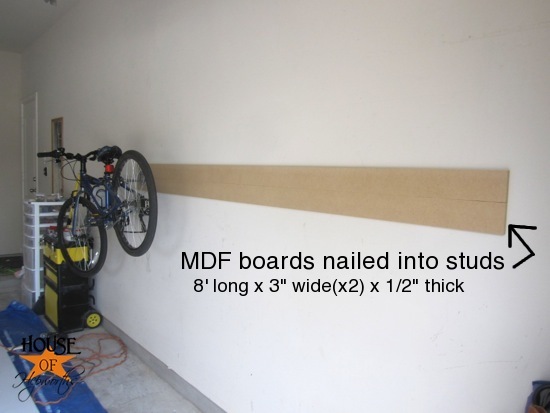 So, once your MDF WOOD is nailed and screwed securely into the studs, simply hang the first bike hanger wherever you’d like it. 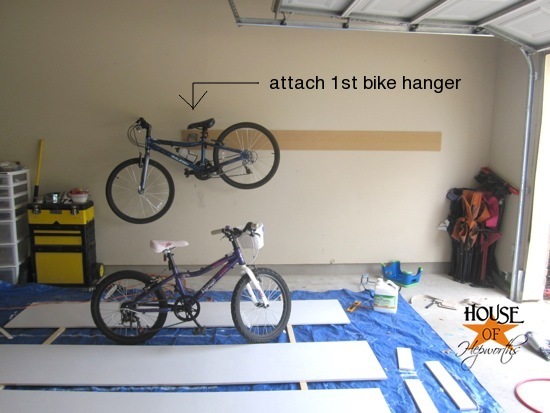 Then attach your 2nd bike hanger. Make sure you put them far enough apart so the bikes aren’t touching! In case you are wondering what all the painted boards are on the floor, I did this bike project between coats of primer for the shelves in my office closet. I had to wait for the primer to dry so I worked on this project in the meantime. With the remaining space I screwed in the tool hooks which hold the scooter handles perfectly. I just squeezed in the scooters wherever there was additional space. I eyeballed all the measurements. The only thing I actually did “the right way” was use a level to make sure the MDF strips WOOD were straight. I chose this lower-than-normal height for the bikes so that the children can still reach them and get them down themselves. The bikes are kind of heavy, so I help with that, but they can get their scooters by themselves. 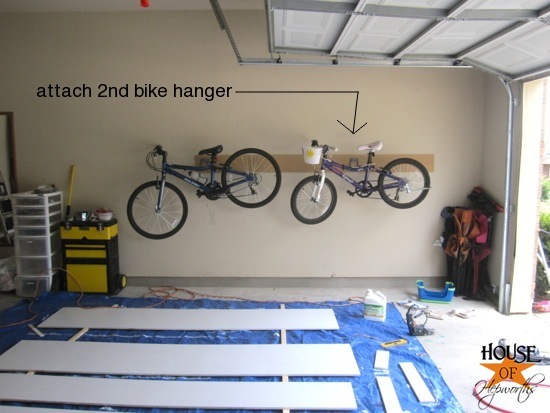 I would have put them even lower, but I park on this side of the garage, so I hung the bikes high enough that the car doors and our shoulders/heads don’t bonk into the handlebars of the bikes. Another good reason to hang your bikes is that it takes pressure off the tires and keeps them from going flat as quickly. I may go back and install two additional hooks for their helmets to hang on, but for now they just hang their helmet on the handle bar of their bike. Works perfectly. Now I’m one step closer to having my house totally organized! It’s such a great feeling knowing that everything has a place and is designed exactly the way I like. 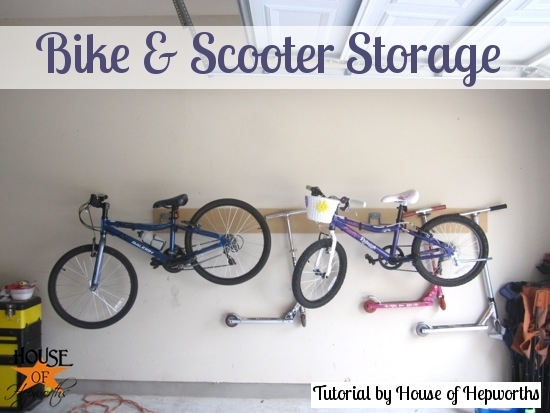 How do you store your bikes and scooters? Aren’t you getting so organized? Love these…we have some of those hangers, also. I like how you used the tool ones for scooters – super clever! Wow- I so totally need to do that. Moving the little bike with training wheels out of the way everytime I unload groceries is getting old. Just showed this to my husband. Thank you so much for doing the research for me and for putting this out there so I can convince him to organize the garage with me! You are clever! We have the Rubbermaid Fast Track, but that does not take care of the scooters! I am so tired of picking them up! When my garage is a little warmer I am going to try this! Great idea! I only wish my garage was so organized. I noticed that you have used what looks like the eco-friendly mineral spirits? Would you be able to review the product or share with me your experience with it? I use “Klean-Strip 1-Gallon Green Odorless Mineral Spirits” that I purchase our local hardware store. I really like it a lot. I have to use it on myself frequently (mainly hands) and it helps the paint come right off. I used it recently to get a ton of roofing caulk off my hands (basically tar). It worked great. It never burns and I just follow up with soap and water. It also doesn’t have an odor which is great. I generally will pour just a small amount into a small container then rinse my hands in the container until the gunk is off. It’s “green” so I can pour it out in my yard when I’m done, which is really nice. Overall, great product, works quickly, doesn’t harm skin, and is odorless. I will definitely buy it again. 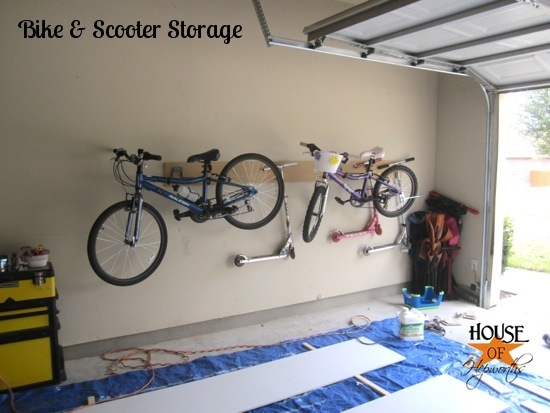 Oh…the organized garage….looks very nice! Thanks for this idea. We’re moving into a home with a single car garage and need plenty of storage for our 4 bikes and 3 scooters! I’ve been wracking my brains and storming the internet trying to find something that my daughter could use by herself. Our last home we used a pulley system that hung the bikes from the ceiling but our daughter couldn’t operate that by herself AND our ceilings in the new place are too low. I’m thinking if I put this towards the hood of the car I could hang it low enough for her to hang her bike and I could put my husband’s “extra” bike above it! 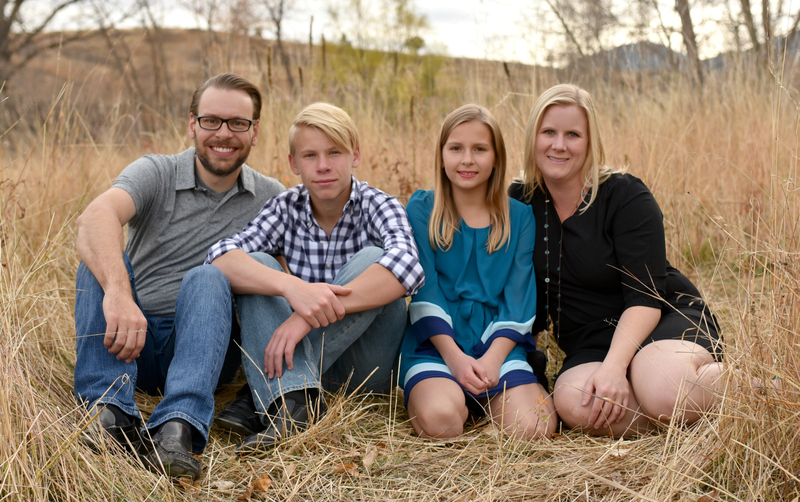 I am curious what ages your children are. 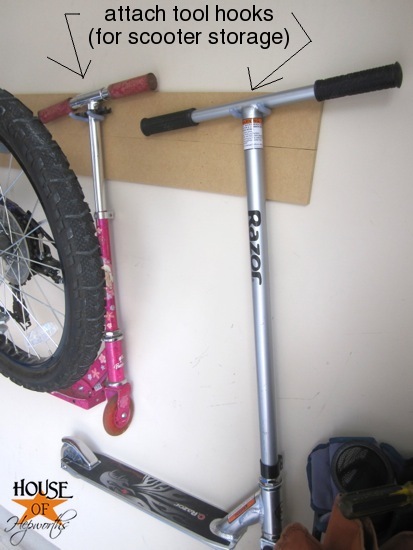 Mine are quite young, 7 and 4.5, and while this solution works for older kids, I cannot see my younger children being able to manhandle the bikes up and down. 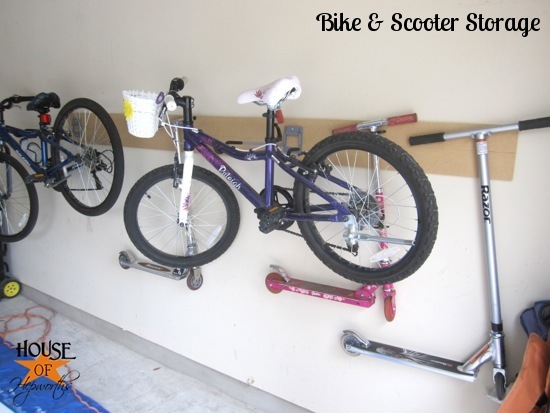 As I child, my father hung the bikes from the wall much lower, but I recall struggling to get the bike up and down. Thanks for the idea about using tool hangers to hand those pesky scooters. I need a outer storage space for my scooter. I don’t want to keep it at home.